The new 5K trail at Rikert Nordic Center is certified for competition at the highest level. MIDDLEBURY, Vt. ― One of the best kept secrets in cross-country skiing is now home to one of the finest race courses in the country. The Carroll and Jane Rikert Nordic Center, operated by Middlebury College and surrounded by the Green Mountains in Ripton, will start the ski season this year with a new five-kilometer trail that has been certified for competition at the highest level by skiing’s governing body, the Fédération Internationale de Ski (FIS). This makes Rikert one of just a handful of ski areas in the country that feature such trails. The new course, designed by legendary trail developer John Morton, will allow Rikert to host major competitions, including the Nordic events at the 2013 NCAA Skiing Championships. 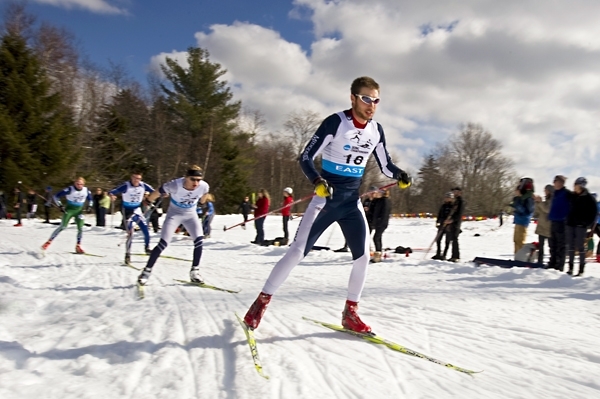 Rikert is home to the Middlebury College Nordic ski team. Recreational skiers will also enjoy the top-rated course, as well as a completely renovated lodge. Now spacious, open and filled with natural light, the lodge includes a ski shop and seating area warmed by a wood stove, a favorite feature that was retained in the new design. Soup and snacks are available for sale or skiers can bring their own lunch. The newly renovated lodge and its restroom meet ADA standards. According to Mike Hussey, director of Rikert, he and his staff are planning to develop adaptive ski programs as a result, along with weekly recreational ski and snowshoe programs for adults and children. Last season, Rikert acquired all-new rental equipment ― both classic and skate skis ― and a brand new groomer to ensure that the trails are in excellent condition. Along with the NCAA championships, Hussey plans to work on attracting other national and major regional events. The developer of the new course, John Morton, has designed numerous trails for private landowners, municipalities, schools, resorts and large competitive international events such as Biathlon World Cup races. A former head coach of men’s skiing at Dartmouth and a 1968 Middlebury graduate, Morton was an Olympic biathlete and coach, and was named to the United States Biathlon Hall of Fame in 2008 and the Vermont Ski Hall of Fame in 2011. Morton’s design at Rikert links 2.5 kilometers of existing trail to 2.5 kilometers of new trail. As what’s called a “homologated” course, it meets FIS standards regarding width, climb levels and total elevation. Site preparation began earlier this year for the new 5K trail at Rikert Nordic Center. According to Hussey, the design process started a year ago. Rikert received its Act 250 permit from the state of Vermont on Sept. 27, 2011, and construction by several local businesses began the next day. Jeffersonville-based G.W. Tatro Construction excavated and graded the course. McAllister Timber Harvesting of Hardwick harvested the trees. Nop’s Metalworks of Middlebury widened an existing bridge and built several new ones that are part of the trail. Goodro Lumber of East Middlebury and r.k. Miles of Middlebury provided the timber for the bridges. “The new course is good news for tourism in the area,” said Hussey. “It also sets the Middlebury College Nordic ski team apart since Middlebury is one of only a few colleges in the country to operate its own Nordic center and now the only one with a course certified at the highest level by FIS,” said Hussey. The Carroll and Jane Rikert Nordic Center is a cross-country ski and snowshoe area located at the Bread Loaf campus of Middlebury College in Ripton, Vt. Bordered by the Green Mountain National Forest, these woodlands provide unspoiled natural beauty near the top of the Green Mountain range. Just 12 miles east of Middlebury on Route 125 and one and one-half miles west of the Middlebury College Snow Bowl, a downhill ski area, Rikert offers 42 kilometers of prepared trails for every level of ability. Rental equipment includes classic skis, skate skis and snowshoes. Repairs and waxing rooms are also available. A full-time staff of professional ski instructors offers lessons on a private and group basis.